Hang Dai Editions announces 2015 slate of signature comix! Hang Dai Editions was formed by New York cartoonists Gregory Benton, Dean Haspiel, Seth Kushner, and Josh Neufeld in 2014 to publish their signature works, some of which they make a point of hand-selling only at shows via personal interaction. SCHMUCK is a graphic novel memoir about one man’s awkward coming-of-age-quest to find love in New York City, written by SETH KUSHNER, with design by ERIC SKILLMAN and a forward by JONATHAN AMES. 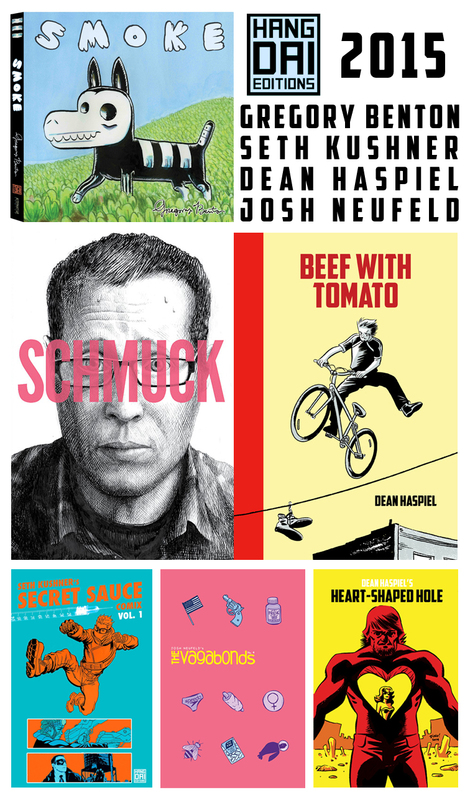 SCHMUCK is an anthology featuring art by 23 great cartoonists, including; Nick Bertozzi, Gregory Benton, Dean Haspiel, Josh Neufeld, Noah Van Sciver, Leland Purvis, Sean Pryor, Bobby Timony, Shamus Beyale, Ryan Alexander-Tanner, George Schall, Nathan Schreiber, Stephen Destefano, Jon Allen, Christa Cassano, Kevin Colden, Tony Salmons, George Jurard, Omar Angulo, Pierce Hargan, Skuds Mckinley, James O Smith, Tim Ogline and cover by Joseph Remnant. After an accident on an industrial farm unhinges two young brothers from reality, they are guided through a weird and wonderful journey by Xolo, the mythological protector of souls. A native New York bruiser is fed up with life in the dregs of a drug-addled Alphabet City where his neighbors are shut-ins and his bicycle is always getting stolen. He escapes from Manhattan to make a fresh start in Carroll Gardens, Brooklyn, only to face a new strain of street logic — where most everything he encounters is not as it seems. Emmy Award-winning artist Dean Haspiel returns to his semi-autobiographical roots with BEEF WITH TOMATO, where he explores the emotional truths between prime and primate. Josh Neufeld’s The Vagabonds #4 serves up a spicy blend of journalism, social commentary, memoir, and literary fiction. This issue features Neufeld’s story of racial profiling at the U.S./Canadian border and three collaborations with Neufeld’s wife, writer Sari Wilson. Throw in a couple of light-hearted travel tips, and The Vagabonds #4 is chock-full of the thought-provoking and witty comics Neufeld is known for. Billy Dogma and Jane Legit punch the apocalypse right in the kisser as their eternal war of woo breaks a Trip City-wide hymen. Seth Kushner’s new anthology features a mix of fumetti/cosplay, indie/sci-fi, and Silver-age inspired heroes by way of THE BROOKLYNITE, drawn by Shamus Beyale, COSTUMED CHARACTERS, layouts by Dean Haspiel, and YOUTOPIA, illustrated by Charles Stewart. Here is a list of HDE’s 2014 comix, still available! Seth Kushner’s semi-autobio webcomic gets a print edition with three stories written by Seth and drawn by Jon Allen, Shamus Beyale and Noah Van Sciver. Cover by Gregory Benton. PSYCHOTRONIC COMIX is Dean Haspiel’s anthology of memoir and Silver Age inspired genre featuring The Red Hook, Tommy Rocket, A-Okay Cool, and NY Stories. FORCE OF NATURE by Gregory Benton, follows an artist through a lush forest as he searches for a lost sketchbook. A lone woman fights the odds in this no-holds-barred short companion piece to B+F by Gregory Benton. Drawn from life, pages from Gregory Benton’s sketchbooks create a loose narrative. Travel through the NYC subway, take in a concert or two, and wash up on the beach. This entry was posted in Uncategorized and tagged Alternative Comics, Dean Haspiel, Gregory Benton, Josh Neufeld, Marc Arsenault, Seth Kushner. Bookmark the permalink. 2 Responses to Hang Dai Editions announces 2015 slate of signature comix! perhaps you could enlighten me on this topic or must I do a cartoon surrounding that cliché …oh but someone probably already has HA,HA !